The snowmobile trails are officially open for the 2018 season. Happy New Years! Gary has been hard at work making tree stump lamps ($75), wood slab tables ($145), towel and blanket racks ($75), birdseye maple cutting boards ($50), barnwood key holders ($30-35) and table/lamp combo pieces (custom price--built to your specs!). Give us a call at (715) 674-3814 if you want any. He also makes custom beds, dressers, cabinets, and just about anything else you can think of. If you've stayed in one of our cabins, you've seen our Adirondack chairs on the porch, just waiting for you to relax and watch the river or enjoy a quiet summer evening. Did you know you can buy one to take home for yourself? Each chair is handmade by Gary. They have curved seats and a curved back--the most comfortable outdoor furniture you'll ever own. Each one sells for $95 unfinished (so you can stain or paint them any way you like) and you can pick them up right at Camp 20 farm. We've always had walking trails available to guests all throughout the farm--Gary even mows them during the height of summer so you won't be swallowed by the grass--but we finally got all of our trail signs up! The farm is mostly made up of wide open fields separated by strips of forest and cut in half by Camp 20 Creek, so it has never been an easy place to get lost--you just follow the creek downstream, look for the next open field, or head uphill and you'll eventually find yourself atop the sledding hill. Now you'll have signs to help you get back on track and to know exactly where you're going. Remember to bring along water, especially during these hot summer months, and to still pay careful attention to where you're going. Ask us how to get started and which way to go. August is blueberry season, so we can even direct you to the blueberry patches. For those of you brave enough to take a little chilly water, the weather should be just fine for taking a dip in the Rat River that runs through the whole town--yes, it's the same one you cross when you drive down main street. 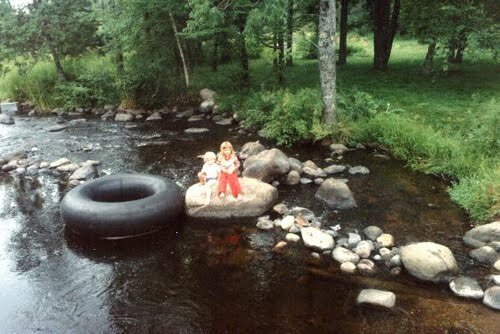 Come down to the bridge near the "Rustic River" cabin and climb into the swimming hole. Our kids used to spend every day in there all summer long--we'd have to lure them out with food just to get them to take a break! Fun fact: the third culvert (when you're standing ON the bridge facing downriver it's the farthest to the right) has colder water coming out of it. Why? There's an underground spring that feeds into it from just the other side of the bridge. Please be careful if you do go in--the currents can be fast, rocks are often hidden by mud, and Camp 20 takes no responsibility for anyone who cares to take a dip in this public river. It seems like we've already had more snow fall and then melt than we had all last season. Hope that's a good sign of things to come, ( not the melting part). We still have availability for over Christmas, or enjoy some relaxing time before or after to catch your breath. Cookie baking is always fun in the cabin too! The Laona Community Soup is Saturday, August 4th. It's one of the biggest events in town and takes place out at Silver Lake beach. Bring a bowl for soup and your running shoes if you want to participate in the Souper Run that morning! Valentine's Day is coming soon--there are two cabins still open that weekend, so if you're looking for some rustic romance, call now! We have tons of snow and the trails are open!